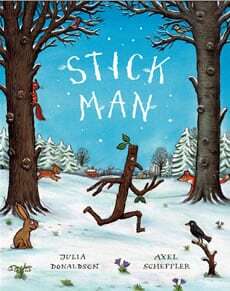 In Stick Man, an anthropomorphised stick ends up far away from his family tree when he is fetched by a dog, thrown by a child, used as a snowman’s arm, and even put on a fire, but finally, Santa Claus steps in to make sure that Stick Man and his family have a joyous Christmas. Julia Donaldson is expert in several distinct areas: This is a writer with an excellent feel for and broad knowledge of folk and fairytale, myth and lore. In common in J.K. Rowling, she knows how to take bits from one well-known tale and mix it up to make an entirely new, popular creation. With elements from The Gingerbread Man, The Night Before Christmas and the structure of a classic myth, we have here a secular Christmas story, hence the snowy cover and big Christmas sales numbers. Donaldson is also an expert rhymester (and performer). New writers are advised to avoid changing the natural order of modern English in order to squeeze lines into a rhyming scheme, but Donaldson gets away with using old-fashioned poetry techniques because she is creating a story-quilt from timeless stories. So it works. Stick Man lives in the family tree/With his Stick Lady love and their stick family three. Along with many of Donaldson’s stories, this one is a bestseller which has been turned into a play and a short film. Stickman has been separated from his family. Stickman wants to go home (for Christmas). The whole world is against Stickman. Every possible use for a stick is explored as Donaldson takes our Stickman on a perilous journey: opponents are dogs, children, a dad, and anyone else who can think of something to do with a stick. Stickman is a reactionary character, flailing about from one perilous situation to the next even worse one, until finally he is thrown onto a fireplace as kindling. Later, when Santa struggles to come down the chimney, Stickman helps out. This isn’t so much to get himself out of strife, it’s because he is a helpful stick. When the Stickman is washed out to sea we think this is the worst thing that could possibly happen to someone who wants to go home to their tree, but when he ends up on a fire, that’s even worse! That’s the masterful thing about this sequence of events; Donaldson really puts her hero through the wringer and we really do feel for the guy. The self-revelation happens for the young reader, who receives a conservative and popular message: If you are nice to people even when you, yourself, are in the most dire of circumstances, people will be nice to you in kind. Stickman is reunited with his family and we assume they spend an enjoyable Christmas together.